Planting Cabbages: Meet the Team of Taste: Cook with Erick! It's time to step up your summer with C'est si Bon! Curious? Schedule a Skype Chat with us to learn more. Here's a little behind the scenes story of the Taste the Adventure Team. It’s spring and sweet sights abound. The red chickens, that my son, Erick helped bring back to C'est si Bon! last summer, run out of their coop and scratch beneath the sweet pink blooming Daphne Odora, eager for bugs and new green sprouts. And so are we, eager, to shout about changes, new sprouts, and delicious dishes, and of course that means fermented natto. Ok. But natto? Must we? My son, Erick, is a professional chef, 2nd generation kitchen critter (a phrase he coined) with specialties like Kaiseki and high-end Japanese cuisine. Before service he breaks-down a hamachi (Japanese amberjack fish) in a time-lapse blur of scales and sharp thin blades, sliding his knife between glistening skin and bones, perfectly portioning the fish, while simultaneously twirling miragai, making mignonette out of shiso, and curing a little tofu, on the side. During the evening service, his knife dances and sings to the hungry sushi bar devotees delivering beautiful moments. In between orders Erick speaks another language, leading his crew. His watch words are wakame and arame. And natto. His hands speak too, hands that he always reminds me that God gave him to use, and create delicious tastes like bacon dashi miso soup, black cod with sikyo miso and charred green onion puree, rock shrimp and egg noodles in tomato and lemongrass broth. I admire and love watching him artfully craft sushi, and teach his staff. I hope still, that maybe one day if I watch enough, my fingers won't stick to the rice, and fumble a hand-roll into a, well, a natto so beautiful thing. Erick makes it look easy, which is part of the art, and skilled technique. Sato sushi timelapse test from Christian Schneider on Vimeo. 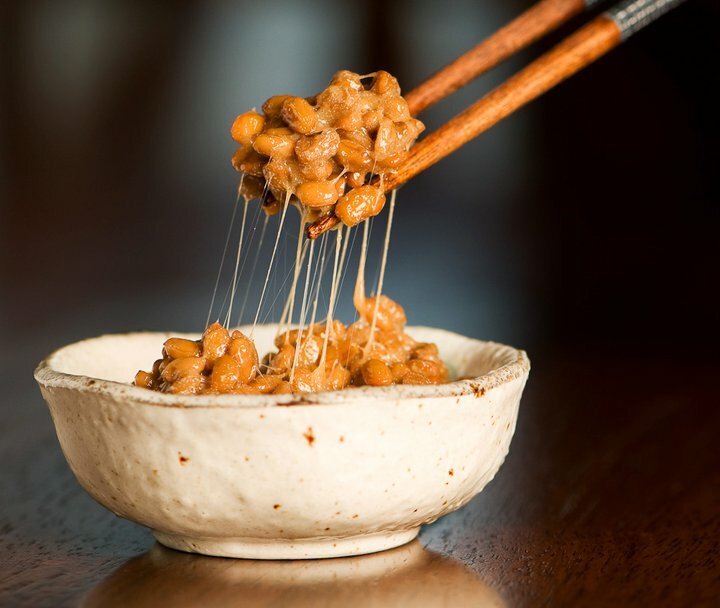 Now at first glance, natto, fermented soy beans, looks rather unappetizing. See Natto. Love Natto. Eat Natto. Erick showed me how amazing natto tastes. And now I seek out natto. Erick teaches me Japanese knife techniques. He’s so fast that I always ask, please, one more time? He shares books about the sea, and fishing, and it thrills me, and scares me to hear his fish stories. One of our favorite haunts, Asian Grocery Stores like H-Mart, where once I led him and his brother Jaryd, to skip down the aisles, and delight at hysterical packaging, wild flavors and messages, steal looks into the backroom where families rolled dumplings together, and offered hot lunches to their staff, it was a truly magic Natto-land. Now I walk through Li-Ming Asian Mart and text Erick photos, and ask, do you know this fermented rice? At the CIA, I always loved the old world techniques – sauce-making among them, and weekend trips into NYC to Chinatown. In Colorado I was a private chef for the silly rich, and in NC I spoke on NPR about coffee and turkey, and got our first flock of chickens. Learned about growing rhubarb, before school we picked sugar snap peas from the new garden by the mailbox. I changed my whisks frequently from Mom to private chef to food stylist to cooking school teacher and back to Mom again. As far back as I could remember Erick had been attracted to the kitchen. And a fast and eager learner. At five months old his eyes opened in surprise, his mouth full of rice in NYC Chinatown. At two he ran into Mekong’s kitchen in Colorado Springs, where the owner, Dang, lifted him up to safely watch Vietnamese shrimp and pork eggrolls, cha gio, get lowered into bubbling oil. 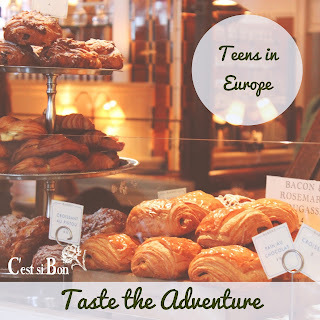 On his tenth birthday he ate civet de canard at Marie-Claude Gracia’s auberge, La Belle Gasconne in Gascony, where now we hold Taste the Adventure for Teens and Families. At twelve he slurped ramen noodles and grilled moonfish while watching tuna being auctioned off at the Suisan fish market in Hilo, Hawaii. At fifteen he was a curly haired teenager bringing home bags of carrots and potatoes to practice knife skills, Julie and Julia style, after his shift in the banquet kitchen at the Carolina Inn in Chapel Hill. Then just as quickly as Hurricane Fran blew through Chapel Hill, and birthed C’est si Bon Cooking School, so Erick grew up and out of our kitchen, and plunged headlong into the restaurant kitchen world and became an Executive Sushi Chef in Vail, Colorado. He has his own tale, and many tales, to tell about being a kitchen critter. In the 15 years since he stepped into the professional kitchen, we’ve returned many times as a family to the “home” kitchen, which isn’t always in our NC home. Whether crafting Thanksgiving, or simply reunion type extravaganzas in France or Colorado, cooking is our family’s medium to communicate. Sharing our worlds. Making delicious food joins our worlds, making them a little bigger, and closer. And a lot tastier. He had returned from Japan and was considering a change. I just stood still and listened. The tables had turned over completely. He had traveled in many ways and paths, and was teaching me things. He had become a teacher. Even now this knowledge fills me with admiration. And a terrifying thrill. Erick asked me what I thought about expanding Taste the Adventure Programs for Teens and Families. And working together. Teaching together. This spring we’ve taken Taste to Boston, Manhattan, Scarsdale, Pasadena, LA, Atlanta, Boca, Washington DC and Maryland and Philadelphia. and next week to San Francisco, where I hope to cook with Erick, and Jaryd, my youngest son, who loves chocolate and mochi and nacatamales. Out of the window the light brown and dusty red cardinals gather twigs and build their nests in the azalea bushes. Soon, they’ll lay eggs and new little red birds will fly out into the world again. 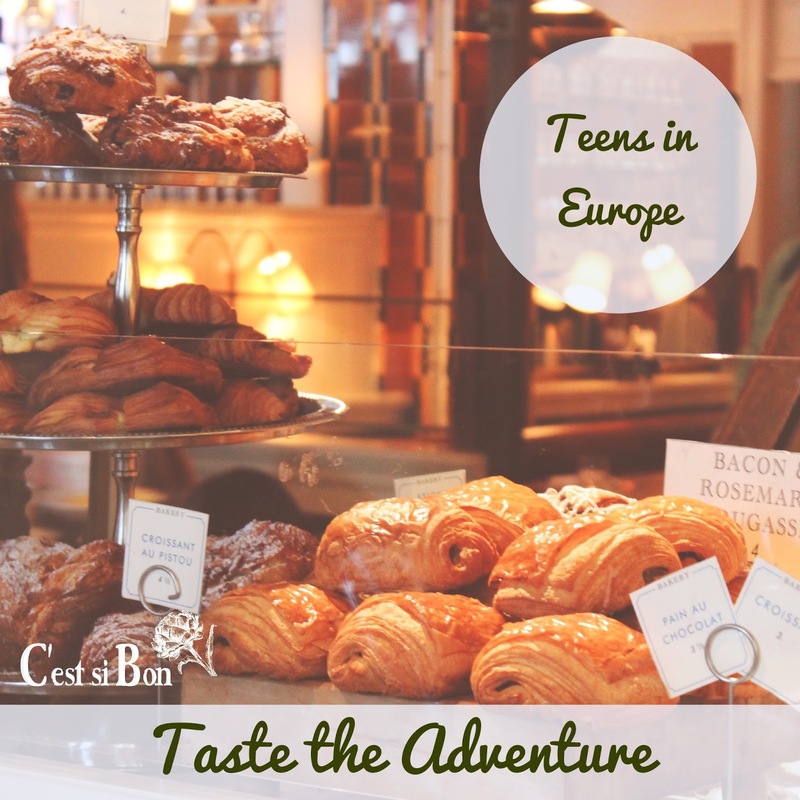 Please Join us for Taste the Adventure for Teens in North Carolina, Gascony and Barcelona! And Taste the Adventure for Families in Gascony. These are so wonderful in the heat of the summer. They require no further cooking beyond cooking the shrimp and the noodles, which can be done ahead of time if you prefer. The flavors are so light, with the flavors of fresh herbs and seasonal vegetables. Some of our most memorable rolls came from the ad lib combination of mangoes and a sweet palette of peppers with cucumbers. The peanut sauce is our favorite. Serve with iced jasmine tea and a pale green honeydew melon accented with orange flower water, nuoc hoa, and lime juice. It’s O.K. to prepare these a couple hours in advance, cover with a damp towel or plastic wrap and kept at room temperature until needed. Combine all the peanut sauce ingredients in a small bowl using a whisk. Serve in individual bowls garnished with chopped peanuts and sliced chiles if desired. In a medium size saucepot cook the vermicelli according to package directions. Drain and set aside on a plate to cool before rolling the spring rolls. Assemble all the ingredients above when ready to wrap the rolls. Have a wide bowl of warm water available to moisten the rice papers. Work with only 2 sheets of rice paper at a time, keeping the remaining sheets covered with a damp cloth to prevent curling. Immerse each sheet individually into the warm water. Quickly remove and spread out on a clean counter top. The rice paper will become pliable within seconds. Lay one piece of lettuce over the bottom third of the rice paper. On the lettuce, place approximately 1 tablespoon of the cooked noodles, 1 shrimp sliced in half, 1 tablespoon each of the shredded carrot and cucumber, plus a few bean sprouts, several mint leaves and fresh basil. Roll up the paper halfway into a cylinder. Fold both sides of the paper over the filling. Keep rolling the paper into a cylinder to seal. Place the rolls on a plate covered with a damp towel so they will stay moist until you fill the remaining wrappers. This is very shiny knife.Knife is very essential element for our households.